When in college or in school, we would find youngsters always with a hobby to collect the pictures of one another and save them for future memories. Gone are those days where we have to purchase the books to take the autograph and collect the hard copy of your friends. Now is the trend for collecting the pictures in online mode and really combine each individual photo collected by you into separate collage that will represent the special group. Not just one collage you may have to maintain each collage for each of the groups that you have in your school or college. This ends up in lot of work which otherwise might disturb your regular curriculum. 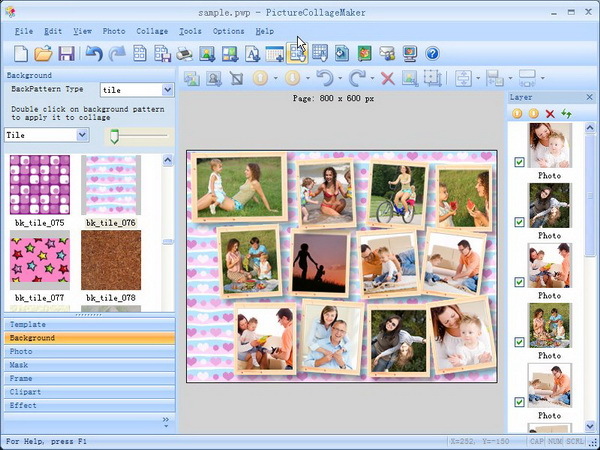 However, you cannot ignore your interest in the collection of memories and this is where the software Picture Collage Maker 3.2.2 can be considered as the best friend to help you in the formation of as many collages as you want. You can turn the ordinary photos as well as pictures you have in your collection into the stunning keepsakes and then share with all the groups that you are part of including family. All the categories like the digital collages, posters, calendars, greeting cards, invitations and the online scrapbooks can all be made possible within simple mouse clicks. Picture Collage Maker is a simple-to-use Windows program that turns ordinary photos and pictures into stunning keepsakes to share with family and friends. Picture Collage Maker is a simple-to-use Windows program that turns ordinary photos and pictures into stunning keepsakes to share with family and friends. With just a few clicks, you can create digital collages, scrapbooks, posters, invitations, calendars, and greeting cards. - Fixed the bug of adding photos. Is Picture Collage Maker your software?